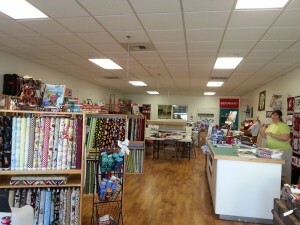 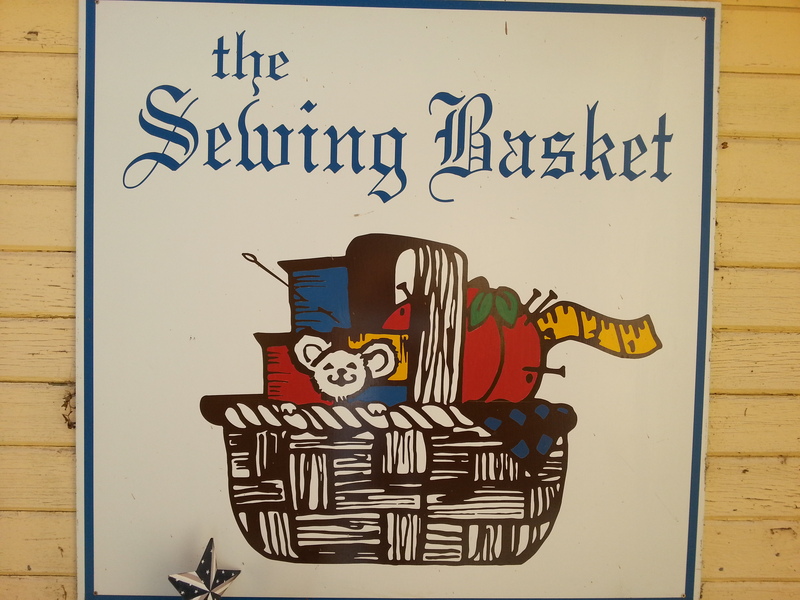 My third stop on the way to Walla Walla, was at The Sewing Basket Quilt Store in the small town of Prosser, just off Interstate 82 between Yakima and the Tri-cities. 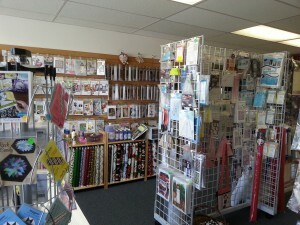 If you only have time for one store, this is it. 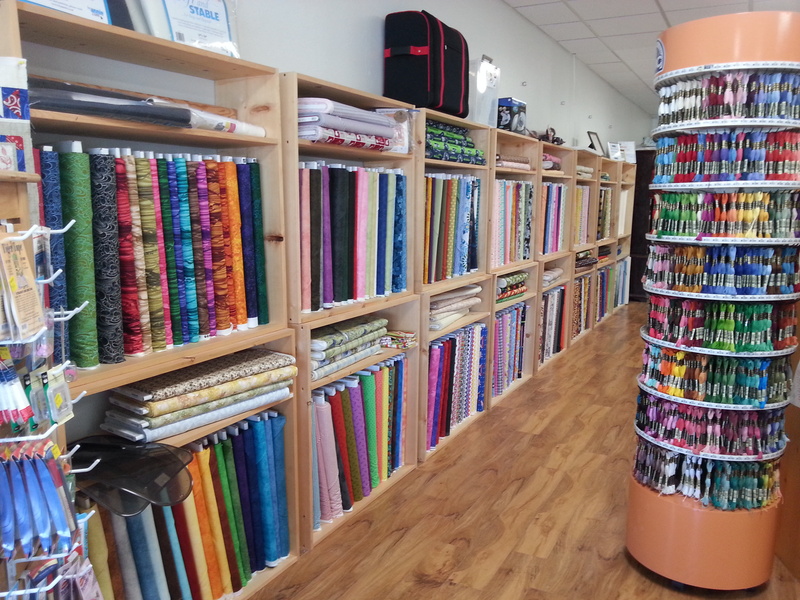 Here’s a little tour around this amazing place which boasts carrying in excess of 11.000 bolts of fabric! 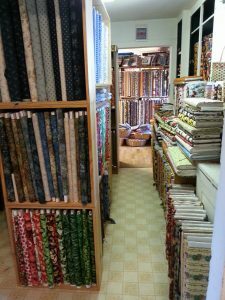 From the outside, it looks like a small shop, but in that little house there are several rooms filled from floor to ceiling with fabric including one devoted to flannels. 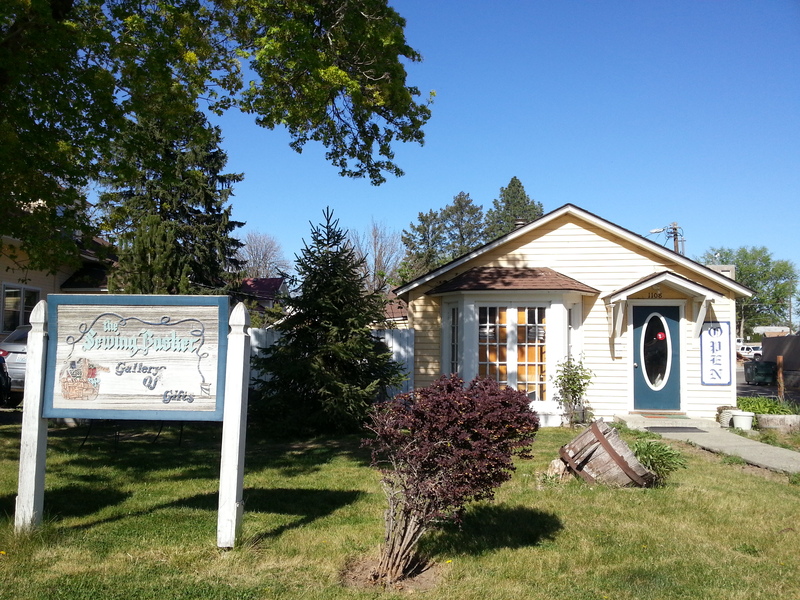 Next door is the Quilted Country Inn, where as many as a dozen quilters can stay for quilting retreats. After perusing the rabbit warren of small rooms stacked with fabric in the little house, you can go out of the back door and follow the path to another building with an enormous room full of more fabric! There’s a huge wall of batiks, shelves and shelves of Christmas fabric, theme fabrics, 30’s and 40’s fabrics, Civil War fabrics and more. 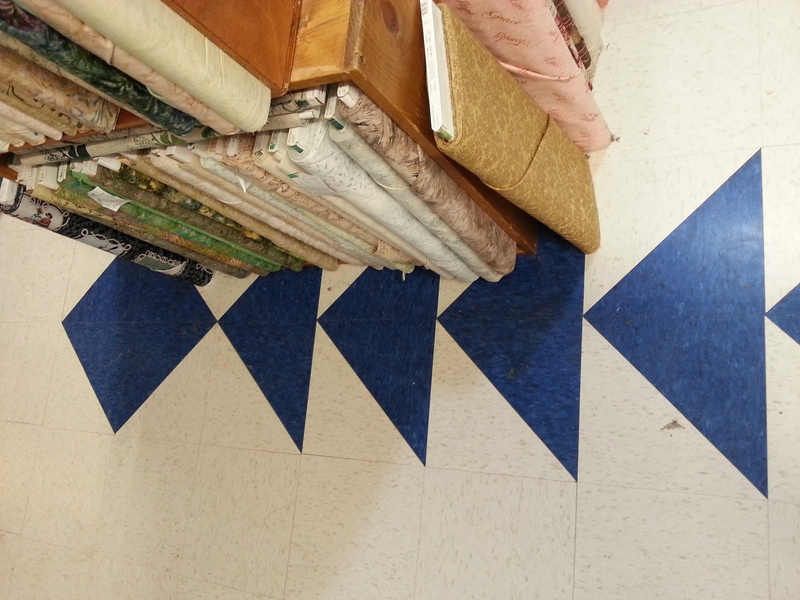 The floor even has Flying Geese and Star patterns in the tiles. 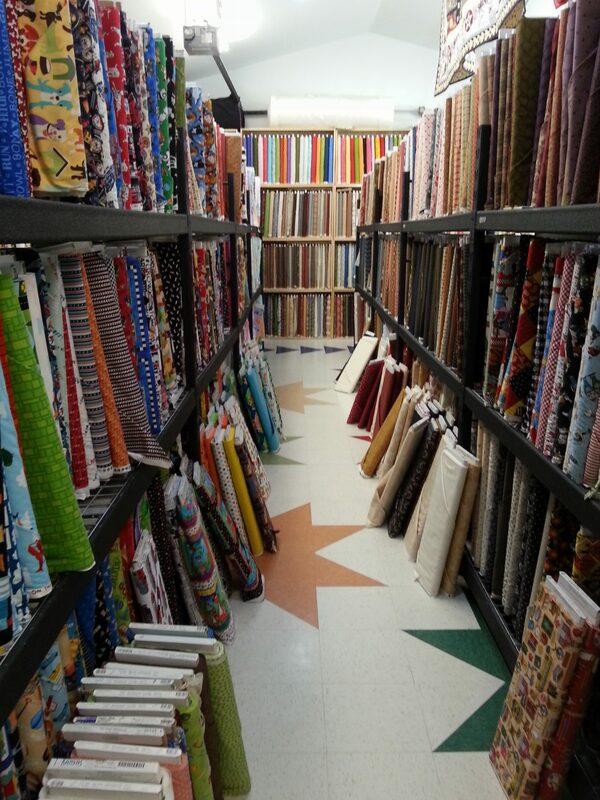 There are many fun theme fabrics. 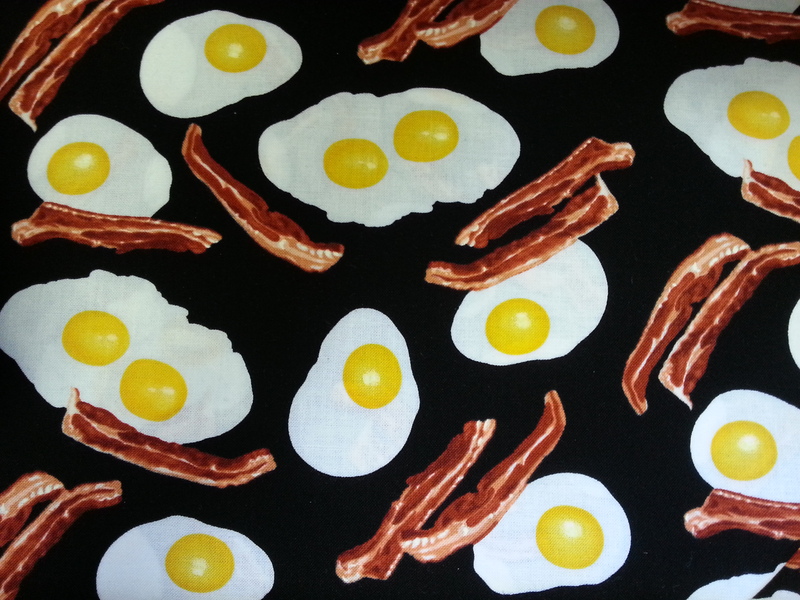 The bacon and eggs caught my eye, along with the chickens and cows. 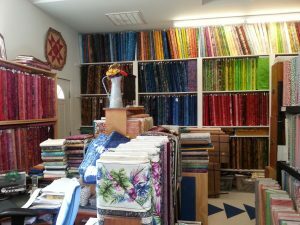 When you plan to visit this place, allow plenty of time! 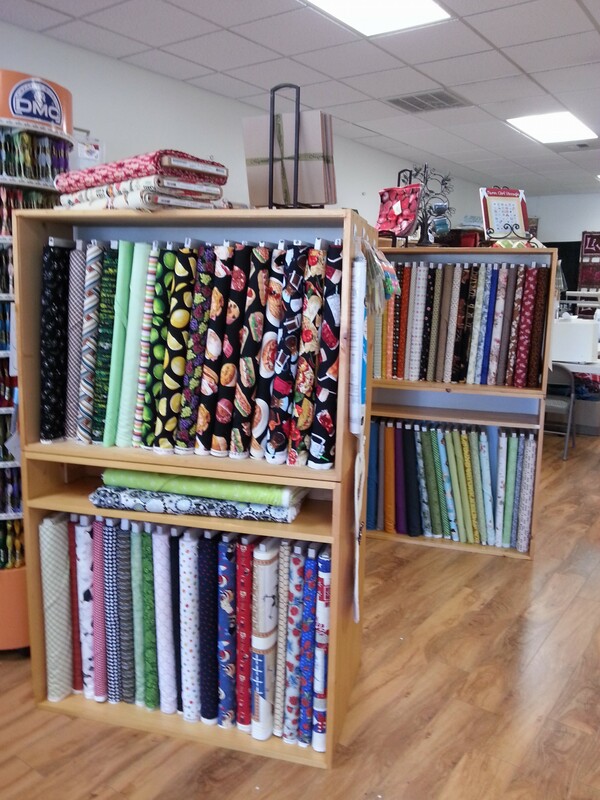 Owner, Marilyn Dulstra, knows exactly where everything is, so if you can describe a fabric you would like, she will direct you to the right location. 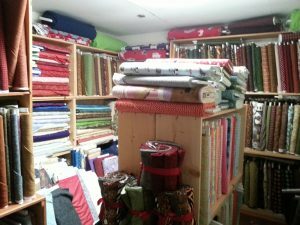 They are about to expand even more! 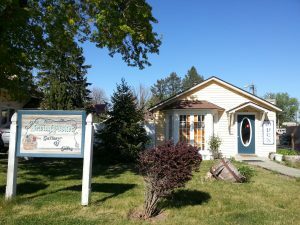 In the past, they have held classes in the Quilted Country Inn, but this has now become so booked up, that there aren’t times when the space is available. They are about to acquire another building where they can have a gallery to display quilts and a classroom. 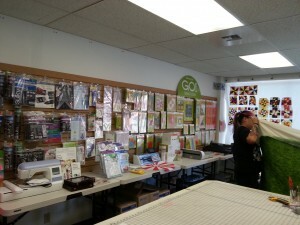 I’m hoping to go back there to teach. 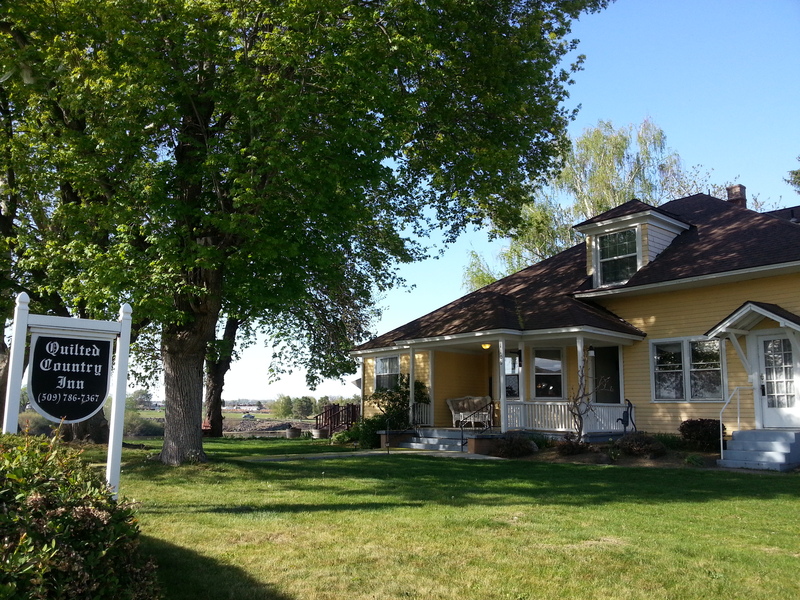 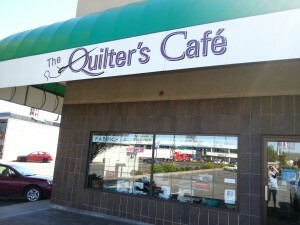 Last week I posted about The Quilter’s Cafe in Yakima. This week I’ll give you a tour of Sandy’s Sewing Center, the second store I visited on my way to teach at the Walla Walla Valley Quilt Guild. 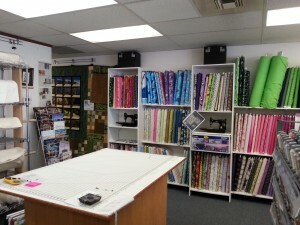 Sandy’s Sewing Center is located at 404 W Chestnut in Yakima not very far from The Quilter’s Cafe, so it is easy to visit both stores if you are passing through Yakima. 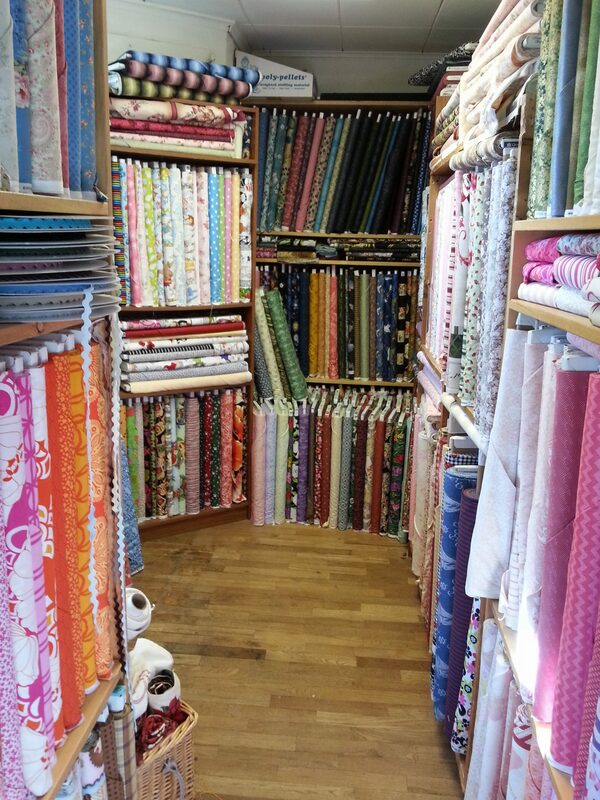 Sandy’s just celebrated their 4th birthday and are well established. The store has a spacious classroom and there were people busy at machines, sewing away. 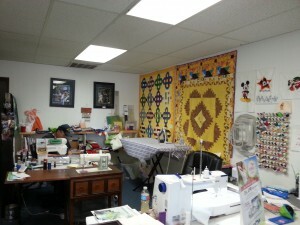 They have frequent sew-in days as well as offering a variety of classes. 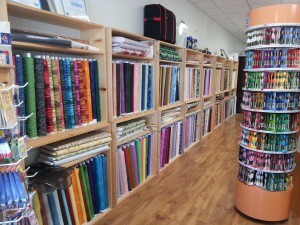 They also have a long-arm sewing machine available for rental and a long-arm quilter who will quilt for customers. 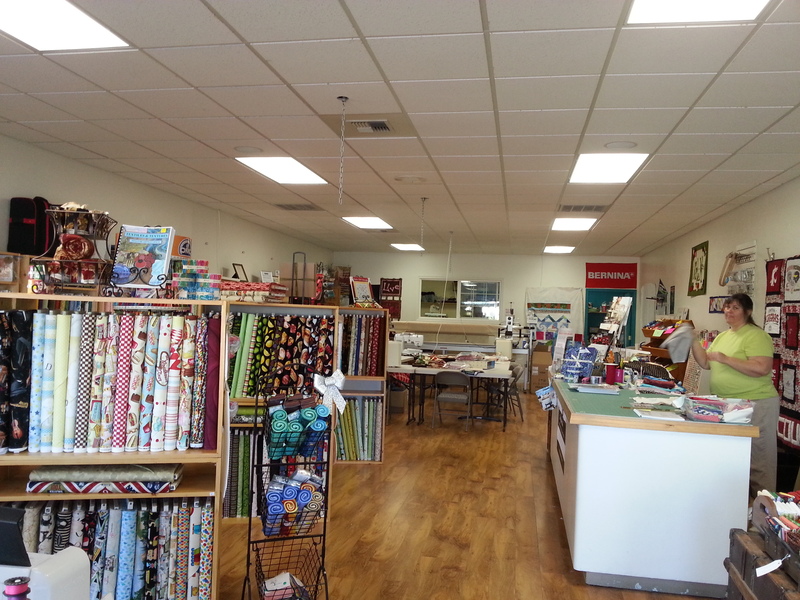 They have a wide selection of quilting supplies and Sandy gave me a warm welcome. 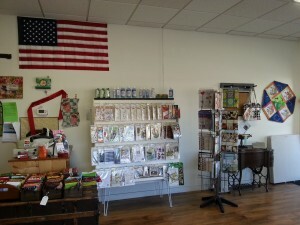 Check it out if you are in Yakima. 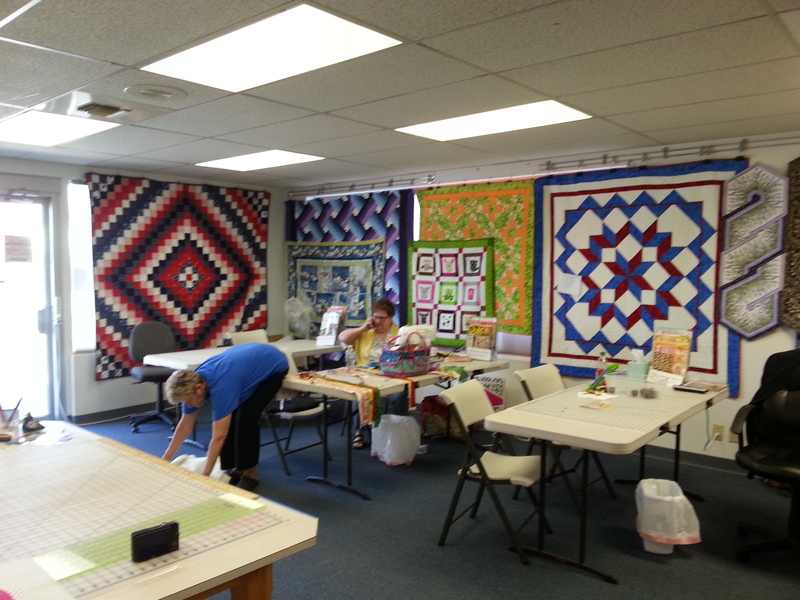 Last weekend I drove to Walla Walla to teach at the Walla Walla Valley Quilters’ Guild. 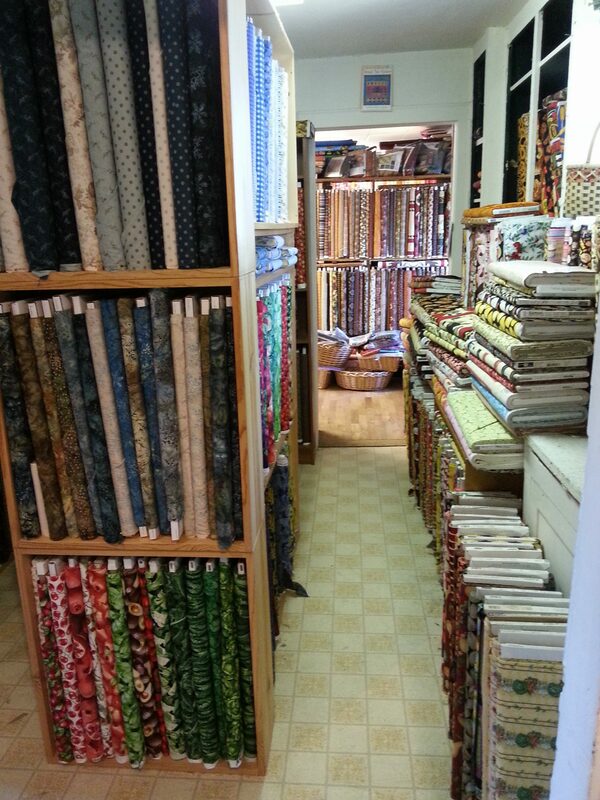 I had all day to get there, so made some stops along the way. 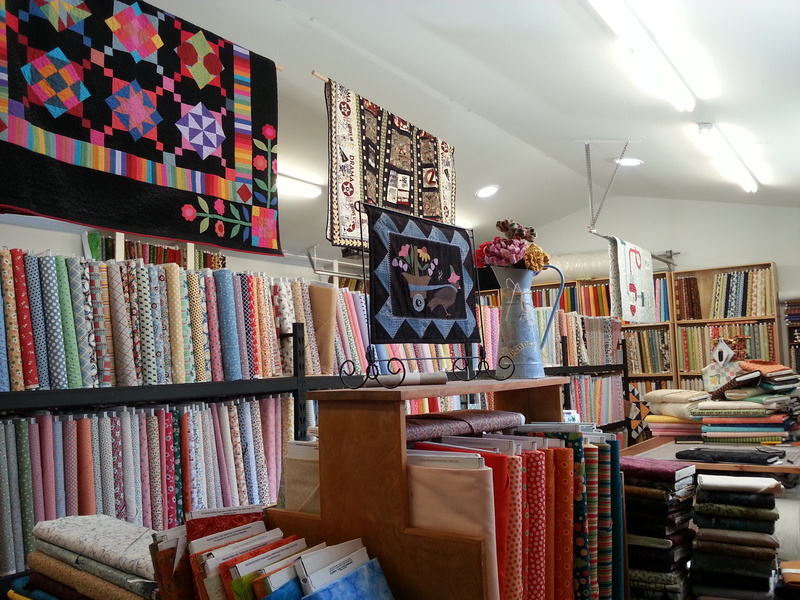 Who knew, there are five quilting shops in Yakima! 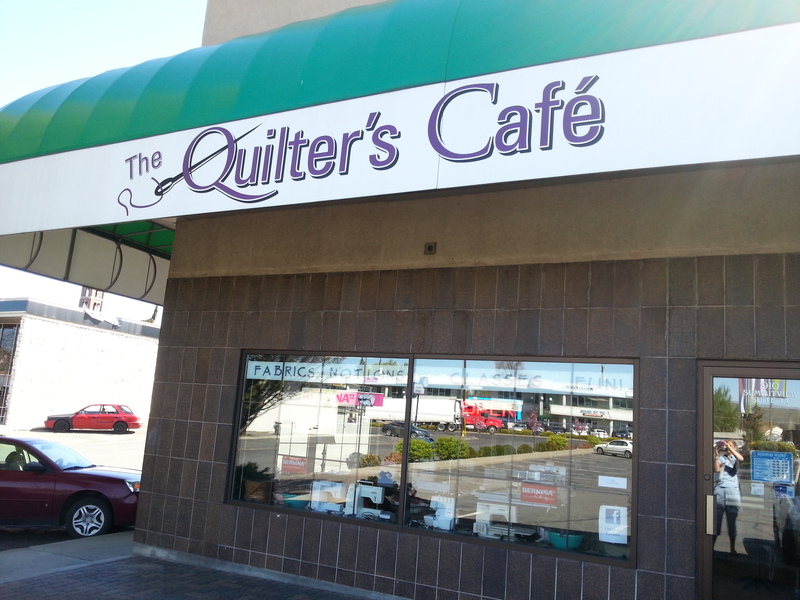 I went to two of them and here’s a virtual tour of the first that I visited, The Quilter’s Cafe, which is located at 910 Summitview Avenue, Suite 1A. Here’s the outside and an attempt at a selfie picture of me with the owner, Linda Sutton. 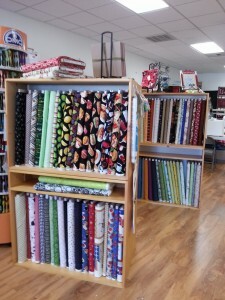 The store sells a good variety of quilting fabric, notions, embroidery supplies, books and patterns. 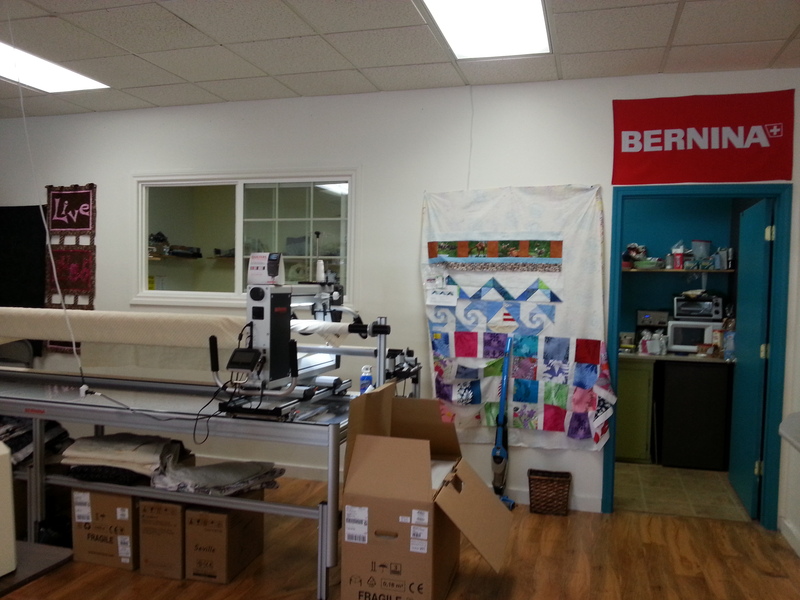 They are Bernina dealers and Linda’s husband, Mike, services and repairs machines. 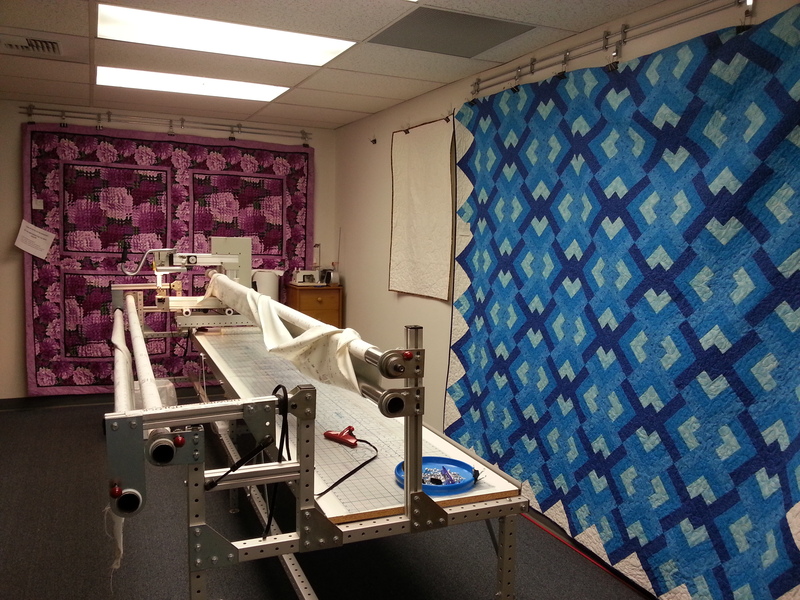 In the back area there is a long-arm quilting machine which is available for rental after clients have completed a couple of training sessions. 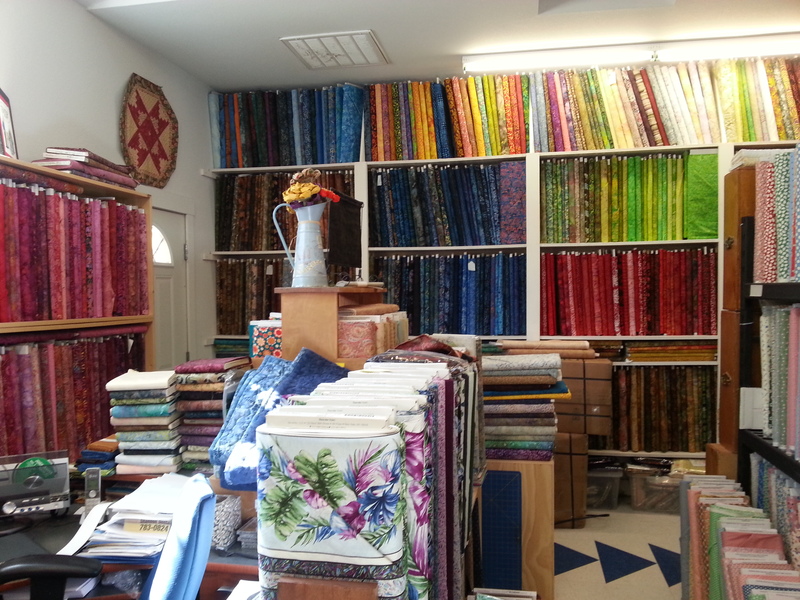 The store is spacious and light. They run classes, have free sew-in days and host the local hand-embroiderers group. 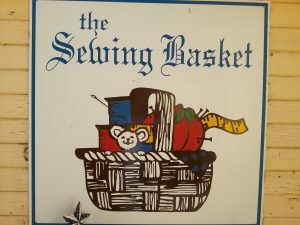 It is well worth stopping by if you are in the vicinity. 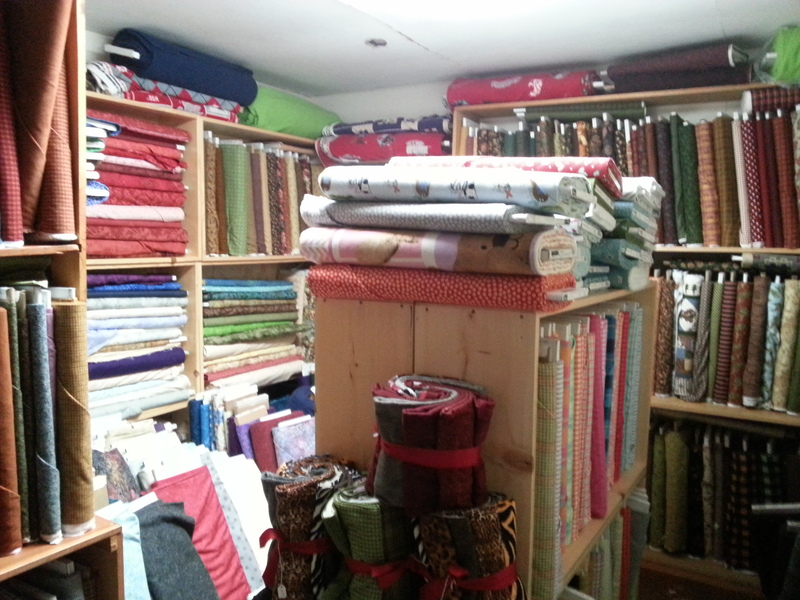 Linda gave me a warm welcome and I enjoyed looking round. 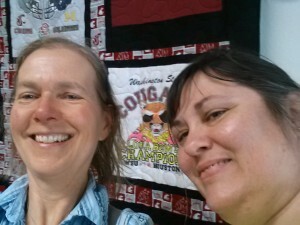 My last few blogs have been about the Sew Expo in Puyallup. My main splurge there was at the Bo-Nash booth, where I purchased an IronSlide Ironing Board Cover and an IronSlide Iron Shoe. 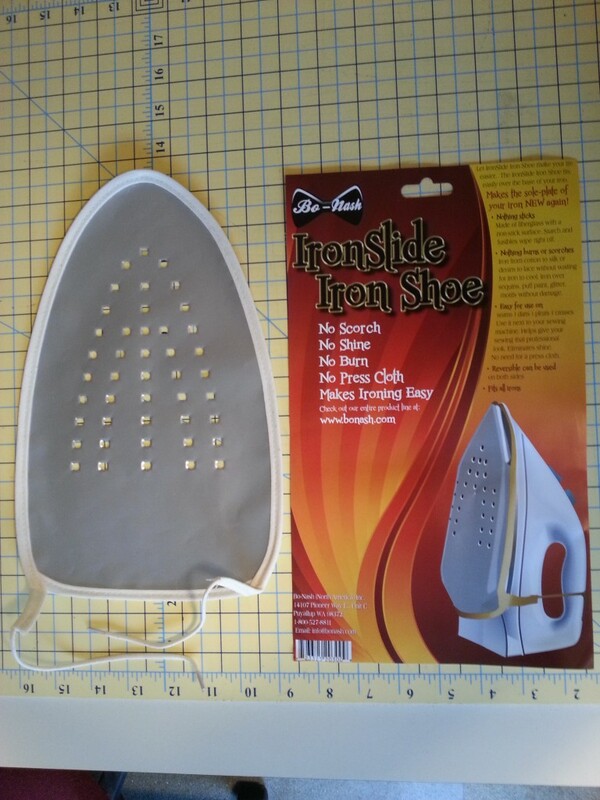 Here, I’ll show you the iron shoe. 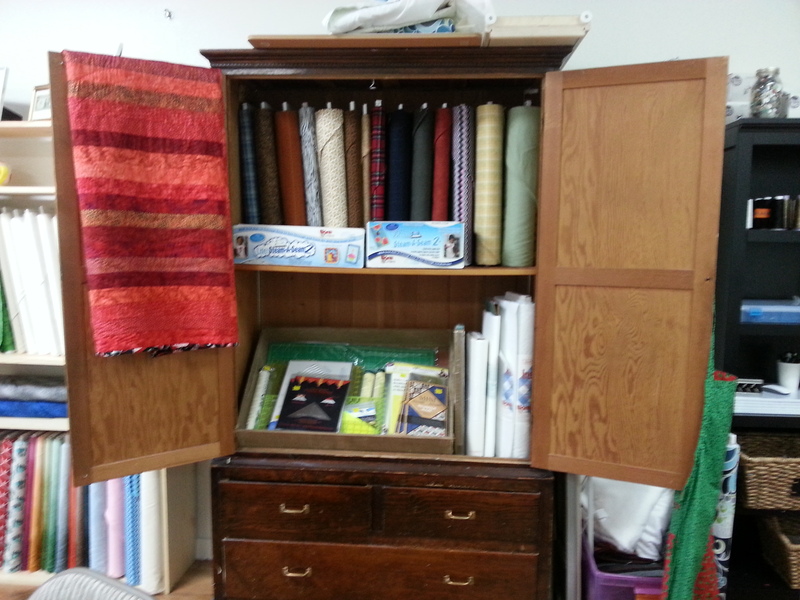 See my blog from last week for the ironing board cover. The IronSlide Iron Shoe is made of fiberglass with a non-stick surface. Starch and fusibles may be wiped off easily. Apparently, nothing will burn and you can iron over things like glitter, puff-paint and sequins without damaging them. 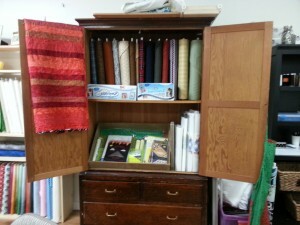 You can also dispense with pressing clothes. 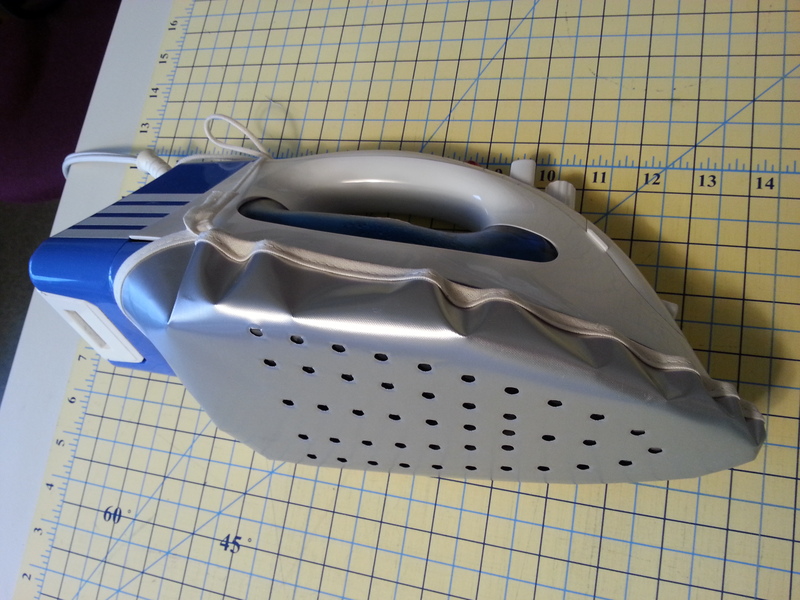 It fits most sizes of iron. 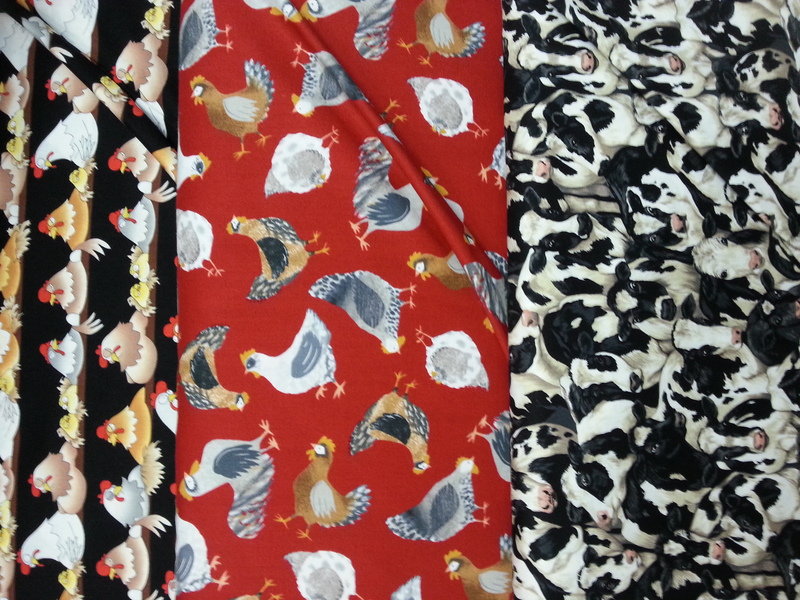 Simply pull on the draw strings and tie for a nice snug fit. I was concerned about losing the sharp point on my iron, but this doesn’t seem to present a problem when I want to iron seams open and has not been an issue. One thing I have noticed when ironing my quilting fabric, is that it tends to create static electricity. 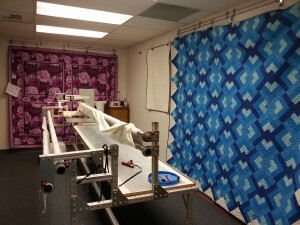 The fabric then clings a bit to the ironing board. 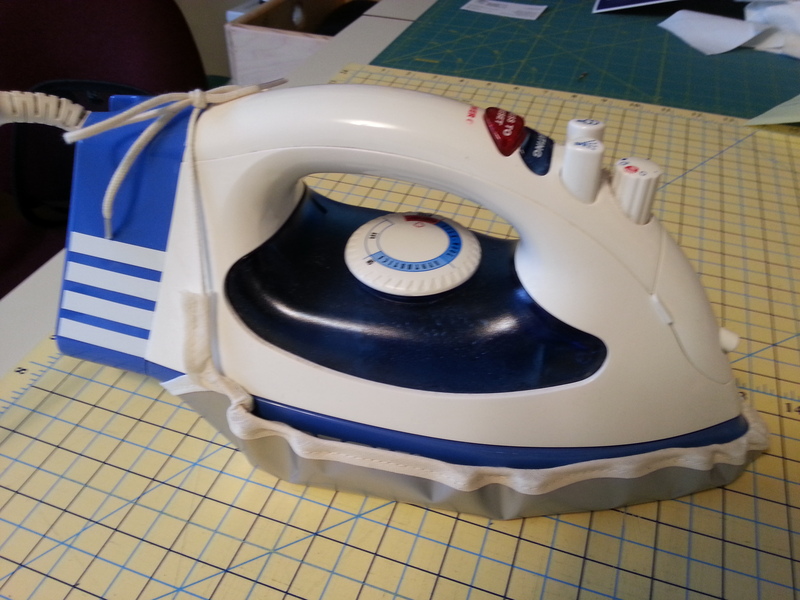 As far as ironing efficiency goes, this in combination with the ironing board cover seem to have made a difference and everything is working nicely.